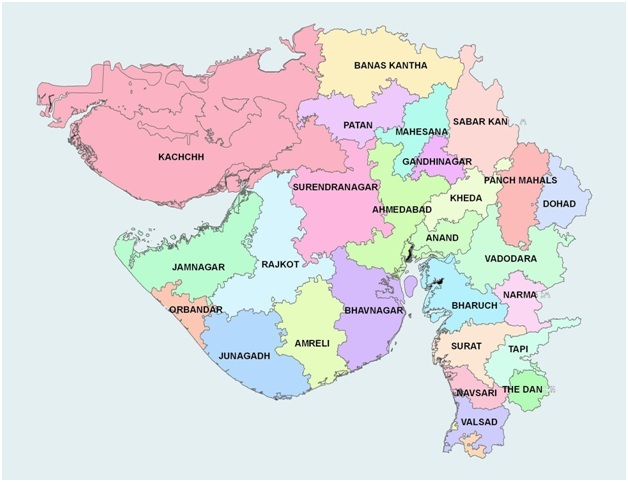 Gujarat is a state in the western part of India, known locally as Jewel of the Western part of India. It has an area of 196,204 km2 (75,755 sq mi) with a coastline of 1,600 km (990 mi), most of which lies on the Kathiawar peninsula, and a population in excess of 60 million. The state is bordered by Rajasthan to the north, Maharashtra to the south, Madhya Pradesh to the east, and the Arabian Sea, as well as the Pakistani province of Sindh to the west. Its capital city is Gandhinagar. It is best known for the Asiatic lions. The official language of the state is Gujarati. Other languages are English, Hindi. International Kite Festival, Diwali, Holi, Janmashtami, Kutch Mahotsava, Navratri, Shamlaji Fair, Modhera Dance Festival, Tarnetar Fair, Bhadra Purnima and Vautha Fair. Gujarat has some of the largest business corporations in India. It is one of the major industrial hubs of India.